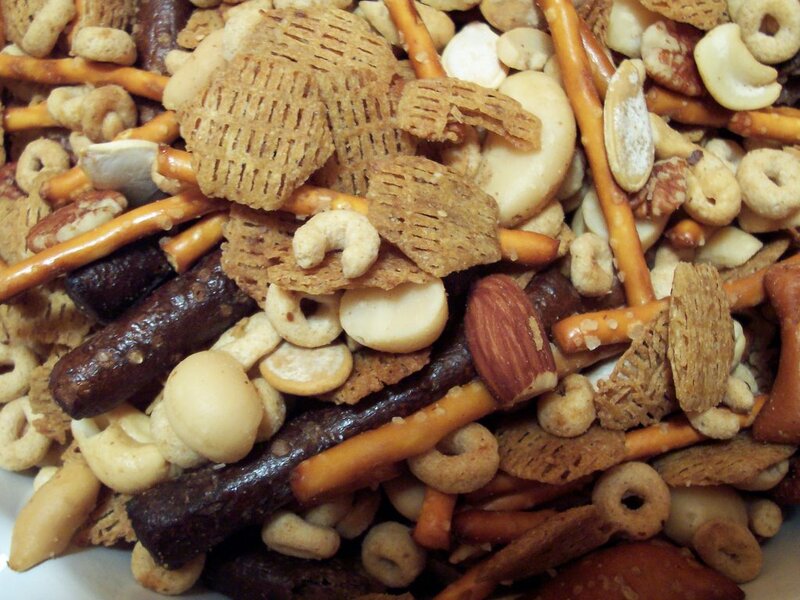 This version of “Chex Mix” was first made by my mother, and every year I make it several times for friends and family. It’s a big hit, as a snack, and you can put it in tins or even gallon size zip lock bags to hand out to friends or co-workers as gifts. (Don’t forget the raffia!) Trust me, you’ll make points. 2 aluminum turkey roasting pans, usually found in the foil section of the supermarket. First be sure you wash out those aluminum pans you bought at the store. They will last for several years of making this stuff so treat’em nice. Dry before you add the ingredients. Before you add the ingredients to the pans, you are going to make a butter mixture, so let’s make that first. Put all the butter, the worchestershire, garlic and hot sauce in a microwavable bowl and heat til it's all warm and mixed together. Or heat it on the stove. It doesn’t have to be real hot. You will definitely NOT need to add salt. Since you are making two pans full, set them both on the counter, and then dump half of each of the ingredients into the pans. You know, open the cereal, and just eyeball what you think is half, and do that with all the rest of the ingredients too. That’ll be close enough. Same thing with the butter. I think it is a good idea to ladle the butter over the ingredients, such that you wet down as much of the cereal as possible. The cereal is the most absorbent of the ingredients and benefits most from the butter mixture. After your ingredients and butter are in the pans, use your hands or a couple of big spoons to turn it over a few times. Bake for 1 hour at 250 degrees. Remove, Turn it over again, this time you better use spoons for sure cuz it’s getting hot. Be sure to bring up the stuff from the bottom and try to get that butter mixed in really well. Then bake for 1 additonal hour, and it’s done! Most ovens will accomodate both pans at once. Let it cool, and scarf. This year I saw a new product which I added and it has been really popular. Snyders of Hanover makes a snack called “Onion Rye Pretzels” which are a 4” stick, about 3/8 inch in diameter, really good. I got’em at Safeway. Other ingredients which have proved to be popular are Trader Joe’s little square peanut butter filled pretzels, (they also have cheese filled pretzels, I bet they would be good) and another ingredient I favor is the whole pumpkin seeds from Trader Joe’s, the white ones in the 14oz. package, they are inexpensive, look cool, and they are super good for you. But only 1 bag of them for the whole recipe, cuz they are fibrous and won’t appeal to everyone. And lastly, macadamia nuts are a great addition, if you are so inclined. Trader Joe’s has them in a bag too. Happy Holidays from Ric, Marie, and Blaine, and have fun!! !